My dad and my brother, Berry, were apple afficionados. They especially enjoyed heritage apples. We always had lots of apple trees including Sheep Nose, Limber Twig, Green Pippin and Early June. These Early Transparents came from a tree planted by one of the two; they got it from Ralph Jenkins, a local farmer who had been grafting heritage twigs into semi-dwarf root stock. The tree is fairly compact and its boughs are bent to the ground with the weight of its fruit this year. My husband,also a great lover of apples, especially the heritage variety, planted a nice little orchard on our own property several years ago with the help of our daughter Amber. We also had a heavy crop this year,but we received a good bit of hail damage a few weeks ago that destroyed a great deal of the fruit. When Mom gave these to me Sunday when we took her home for church I knew he would enjoy the applesauce they would make. Early apples tend not to be good keepers though. 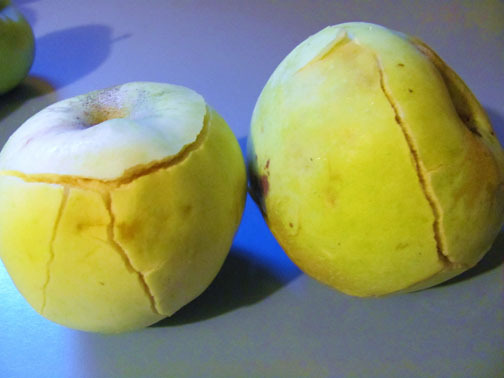 If you don't prepare them quickly the quality really deteriorates fast; usually they get rotten spots but these apples do something else altogether before the brown rotting occurs. 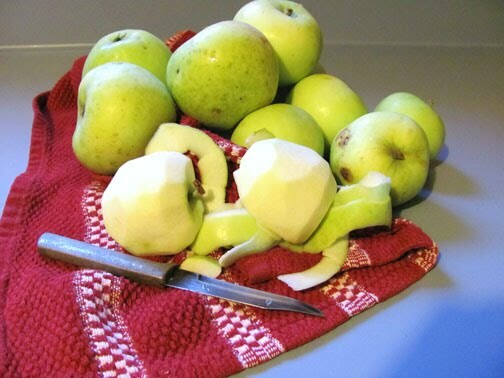 When I went into the kitchen yesterday afternoon after a long day working online on my grad school classes, many of the apples had cracked and broken skins. It is almost as if they continue to literally grow out of their skins after they have been picked! Those that were cracked had undergone a color change in the flesh as well so they went into the waste with the peelings and those that had already become mottled with rot. They really should have been prepared Sunday evening. I knew this from past experience but life just gets away with us sometimes. I remember those apples. When they crack like that they have gone to mush - much like moist sand. When not overripe they are very juicy and firm, tart and good. Sadly my one lone apple fell off the tree before it was larger than a golf ball, but the blueberries limbs are weighted down! I have never seen apples do that before! But we don't have apple trees here to pick early apples from anyway...very interesting. Thank you for stopping by recently and leaving a comment! I have a yellow transparent. The first year I lived here I couldn't figure out why all the apples were dropping before they seemed ripe. :) They are fantastic for baking and I also dry a lot. Very small crop on my tree this year.